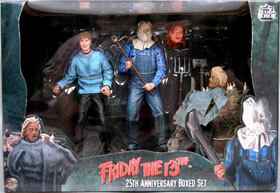 Description Of Item: In commemoration of the 25th anniversary of the classic Friday the 13th horror film franchise comes this amazing boxed set featuring the action figure debut of Pamela Voorhees (with machete, knife & sheath, axe, bow & arrows) and Sack-Head Jason (with removable mask and alternate head, pick-axe, pitch fork, machete)! The centerpiece of the set is Jason's macabre shrine to his dead mother, featuring her corpse (plus those of some young victims)! The figure bases can combine with the shrine's base to create a unique scene! Window box packaging.